First Appearance: Hero for Hire #1 (June 1972): "Out of Hell -- A Hero!" The Amazing Spider-Man (vol. 1) #600 (Sep. 2009): "Covers You'll Never See!" Black Panther (vol. 4) #12 (Mar. 2006): "Black Steel in the Hour of Chaos"
Black Panther (vol. 4) #13 (Apr. 2006): "White Light, Black Heat"
Captain America and the Falcon (vol. 1) #5 (Sep. 2004): "Jimmy's Way"
Daredevil (vol. 1) #178 (Jan. 1982): "Paper Chase"
The Defenders (vol. 1) #17 (Nov. 1974): "Power Play!" The Defenders (vol. 1) #18 (Dec. 1974): "Rampage!" The Defenders (vol. 1) #19 (Jan. 1975): "Doomball!" The Defenders (vol. 1) #24 (June 1975): "--In the Jaws of the Serpent!" The Defenders (vol. 1) #25 (July 1975): "The Serpent Sheds its Skin"
The Defenders (vol. 1) #37 (July 1976): "Evil in Bloom!" The Defenders (vol. 1) #38 (Aug. 1976): "Exile to Oblivion!" The Defenders (vol. 1) #39 (Sep. 1976): "Riot in Cellblock 12!" The Defenders (vol. 1) #40 (Oct. 1976): "Love, Anarchy and, Oh Yes... the Assassin!" The Defenders (vol. 1) #42 (Dec. 1976): "And in this Corner: The New Emissaries of Evil!" The Defenders (vol. 1) #43 (Jan. 1977): "This World Is Mine!" The Defenders Annual #1 (Oct. 1976): "World Gone Sane?" Enter the Heroic Age #1 (July 2010): "Top Dog"
Fallen Son: The Death of Captain America #2 (June 2007): "Anger"
Giant-Size Avengers (vol. 2) #1 (Feb. 2008): "Emperor None & the Sky Full of Moons"
Heroes for Hire (vol. 1) #1 (July 1997): "Heroes and Villains"
Heroes for Hire (vol. 1) #2 (Aug. 1997): "Blowup!" Heroes for Hire (vol. 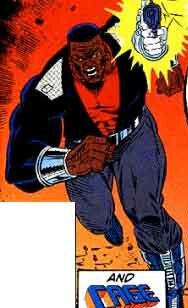 1) #3 (Sep. 1997): "Give & Take"
Heroes for Hire (vol. 1) #4 (Oct. 1997): "Controlled!" 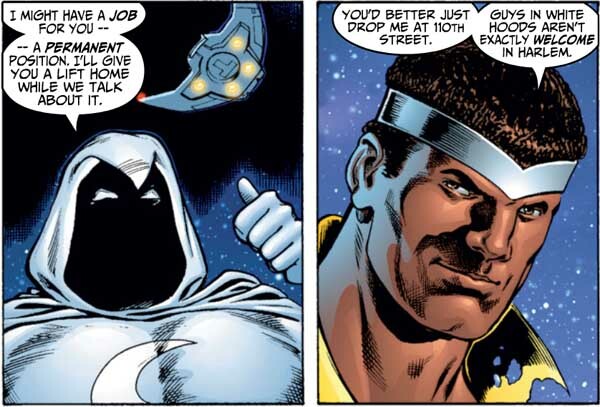 Heroes for Hire (vol. 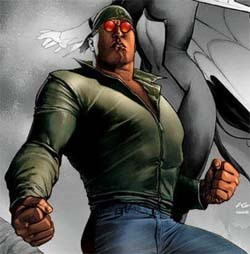 1) #8 (Feb. 1998): "Revelations (Book One)"
Heroes for Hire (vol. 1) #13 (July 1998): "Fallout!" Marvel Fanfare (vol. 1) #9 (July 1983): "The Butch Guice Portfolio"
Marvel Knights Spider-Man #14 (July 2005): "Wild Blue Yonder, Part Two"
Marvel Knights Spider-Man #18 (Nov. 2005): "Wild Blue Yonder: Conclusion"
Marvel Knights Spider-Man #21 (Feb. 2006): "Spider-Man: The Other--Evolve or Die Part Eight: Aftermath"
Marvel Universe: Millennial Visions #1 (Feb. 2002): "United We Stand"
The New Avengers (vol. 1) #1 (Jan. 2005): "Breakout! Part One"
The New Avengers (vol. 1) #3 (Mar. 2005): "Breakout! Part Three"
The New Avengers (vol. 1) #4 (Apr. 2005): "Breakout! Part Four"
The New Avengers (vol. 1) #5 (May 2005): "Breakout! Part Five"
The New Avengers (vol. 1) #6 (June 2005): "Breakout! Part Six"
The Secret Defenders #15 (May 1994): "Strange Changes, Part 1: Strangers and Other Lovers"
The Secret Defenders #16 (June 1994): "Strange Changes, Part 2: Resurrection Tango"
The Secret Defenders #17 (July 1994): "Strange Changes, Part 3: On Borrowed Time"
Silver Sable and the Wild Pack #13 (June 1993): "For Love nor Money, Part Three: Precarious Alliance"
Silver Sable and the Wild Pack #14 (July 1993): "For Love nor Money, Part Six: Unholy Righteousness"
Spider-Woman (vol. 4) #7 (May 2010): "Agent of S.W.O.R.D. : Part 7"
Young Avengers #7 (Oct. 2005): "Secret Identities: Part One"
Young Avengers #8 (Nov. 2005): "Secret Identities: Part Two"